Byron is an architect who has been volunteering at Meher Mount since 2007 and helping to develop and implement Meher Mount's Master Plan. He is a founding partner of the architectural firm, HPA, Inc. in Irvine, CA. Byron took a giant step toward documentation on Thursday, December 21, 2017, when he went to Meher Mount armed with over-sized maps of the property from Google Earth and a camera. He walked the property noting burned areas, damage and other items of importance. The next day he sent Meher Mount five maps with notes identifying locations and items for action. 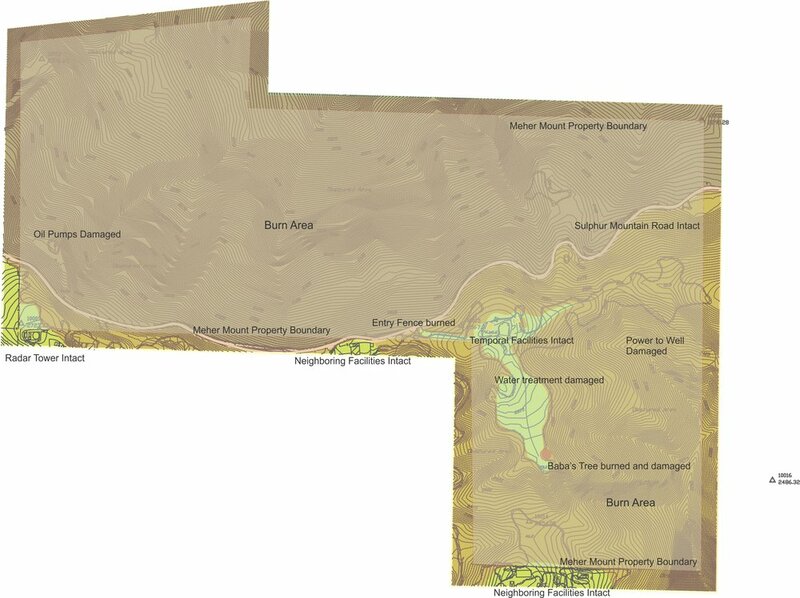 The above map is an overall view of Meher Mount's property with north at the top. The light-orange, squiggly line is Sulphur Mountain Road, the main public road that goes through Meher Mount's property. All the land above the road is actually on the downhill side of Sulphur Mountain facing the city of Ojai. Much of that area was burned. It is mostly wilderness and will be left to regenerate naturally. The light green area is the part of Meher Mount that most visitors see. Baba's Tree - the darker orange spot in the lower section of map - sits on a hill called Avatar's Point. From there, the property slopes downward to the south toward the city of Ventura. The burned areas below Avatar's Point are semi-wilderness and will be left to regenerate naturally. 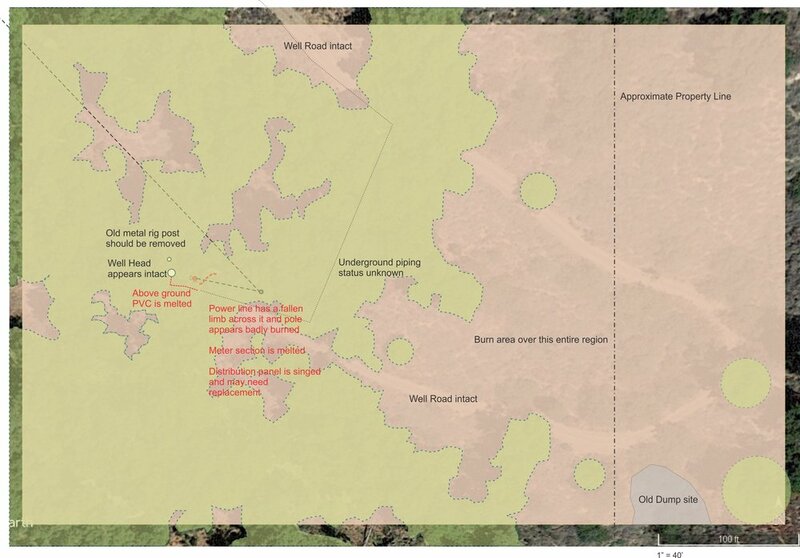 The other areas of the property involved in recovery, restoration and regeneration are in the following detailed maps. The white portion of the map indicates the meadow and pathway area to Baba's Tree from the Visitor Center. At the edges of this white area, the property slopes sharply downward toward the Pacific Ocean (on the left) and toward the city of Ventura (on the right). The burned area below Avatar's Point is the Prasad Orchard. In the short-term, the orchard area will be left to regenerate naturally. The dense oak area to the right of Baba's Tree will also be left to regenerate naturally. At Baba's Tree, in the center marked "primary ash deposits" is where much of Baba's Tree trunk burned. There is also a small oak under the canopy - that is an offshoot of Baba's Tree - that is still standing and appears intact. Meher Mount is consulting with professional, certified arborists regarding the regeneration of Baba's Tree (and other oaks on the property) and its ongoing care. The only structural damage to any building is the trellis attached to the Visitor Center/Caretaker Quarters (noted in red). This repair is a priority before Meher Mount can be open to visitors. The interior and furnishings – upholstery furniture, rugs, paintings, beds, etc. – and personal items – clothing – need to be treated for smoke damage. The inside of the building will be cleaned and repainted. A stand of Eucalyptus trees near the chimney burned because Eucalyptus is more flammable than the Coast Live Oaks (Quercus agrifolia). The plan is to remove the invasive Eucalyptus. In addition, there is another large, burned Eucalyptus tree by the directional sign for Baba's Tree which Southern California Edison has tagged for removal. The Topa Topa Patio and Workshop were not damaged by the Thomas Fire. Neither were most of the nearby oaks. The downed Coast Life Oak (Quercus agrifolia) marked in red will have to be removed. Meher Mount will seek advice on replacing it with another oak or another native, drought-tolerant tree that fits the plant community. There was an old oak stump by the corner of the Topa Topa Patio that was virtually vaporized in the fire. The remaining hole will be filled and the dirt compacted. The foundation of the patio does not appear to be compromised. At the entryway, the mailbox and stone signs are intact. There was some charring along the bottom of the main stone sign for Meher Mount, which actually adds character to the sign. The wooden fence extending on either side of the heart gate was burned. There was some resulting damage to the area with vehicles driving around to the left of the gate after the fire. On December 21, 2017, a temporary 100-foot, post-driven, chain link fence with a security screen was installed. It extends from the neighbor's fence and across the brow of the small hill by the driveway. In keeping with the guidelines in Meher Mount's Master Plan to use fire-proof, fire-resistant materials in new construction, Meher Mount is planning to replace the wood fence with one made of wrought iron or other metal. The board previously adopted recommendations from the Stone Signs & Markers Committee that when the time was appropriate to replace the existing gate to construct a new gate that fit Meher Mount’s design vocabulary, was remotely controlled, and was part of the design of the fence. The gate design would be evocative of Baba’s Tree and include a heart that is part of Meher Mount’s logo. The damage to the electrical system at the well is marked in red. There are melted pipes that need to be replaced. In addition, before a full assessment of the damage – if any – to the well pump and related pipes can be made, there needs to be electricity. Meher Mount must first replace two electrical poles on the property and electrical panel that suffered fire damage. After that, Southern California Edison will return electricity to the area. All the burned oaks and landscape will be left to rengerate naturally. Most of the water treatment system appears intact. There are burned pipes that need to be replaced as well as a burned ozonator. Once the well is pumping, a further assessment can be made. The pool cover was burned, and Meher Mount is getting a bid for its replacement. The fence around the pool is a mix of metal and wood posts, and some of the wood posts are damaged. Meher Mount will get a bid for replacing the pool fence around with a sturdier fence and gate using all metal materials.